Growing up, Jessica Collins remembers her physician father working long hours, sometimes hearing him take late-night calls. Although she never wanted to follow her father’s footsteps into the medical profession, she now finds herself in the position to help healthcare providers spend more of those long hours doing what they love best: caring for patients. As senior vice president and general counsel for athenahealth Inc., Collins works to maximize the time and attention doctors and other healthcare providers can devote to patients rather than paperwork by providing cloud-based services including practice management and care coordination. Her legal team isn’t directly developing products or connecting with clients to streamline services in doctors’ offices and other medical settings, but she sees their work as a critical contribution toward achieving athenahealth’s mission to disrupt and transform healthcare by giving providers more freedom for face-to-face interaction with the patients they serve. To put herself and her staff in a better position to listen and learn, Collins and others in the legal department have been working more closely with other teams. Some legal team members even serve as designated legal representatives within other departments, sitting in on staff meetings and other important matters. Members of Collins’s staff become embedded in other departments so they can help address legal questions during the planning process and can also provide valuable background knowledge to the rest of the legal team if an issue requires more attention, she says. The legal team also devotes time to educating other staff members about industry issues including privacy and population health management. In addition to periodic teaching sessions, Collins’s department introduced an area on the company’s internal website they call “LegalEase,” which provides answers to a range of commonly asked questions. “None of it is confidential information, and it’s not specific legal advice, but it’s a resource for people to get answers without having to ask six different lawyers the same question,” Collins says. Too often, the legal team—especially in large companies—is seen as a barrier for developers or researchers, Collins says. But she’s finding that the more often she and the rest of her staff participate in conversations within other departments, the more often they’re invited to a seat at the table early on and the less often they have to introduce roadblocks near a project’s finish line. Collins attempts to create that engagement on her own team by soliciting ideas and input from every member of the legal staff. It’s an approach she learned from a mentor who treated her as a valuable team member even though she was fresh from law school. Her ideas weren’t always incorporated into projects, but, because she was an active participant throughout the planning process, she says she was able to learn why they didn’t make the cut. Engaging others in the decision-making process and fostering stronger connections between her team and the company helps Collins see her job as much more than reinforcing legal rules and regulations. “To be in a place where I’m in a position to help doctors do what they want to do versus filling out charts for extended periods of time or spending more time on the phone when they could be face to face with a patient is really rewarding,” she says. Better yet, Collins managed to find a career just as fulfilling as her father’s, without quite as many late-night calls. 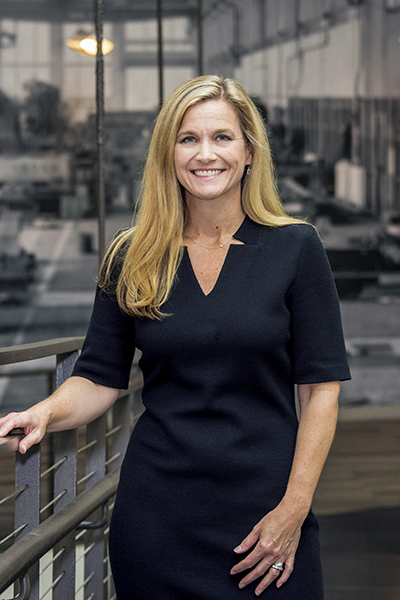 Jessica Collins, the first woman to be named general counsel at athenahealth, encourages engagement among her staff in a number of ways, including promoting active participation in the company’s corporate responsibility program, athenaGives. The program not only gives free cloud-based products and services to healthcare providers who work in underserved areas and provide quality care to the uninsured, but also enables employees to provide pro bono services to help local communities. As one example, members of Collins’s team are assisting eligible immigrants who apply for citizenship through the organization Project Citizenship. The pro bono work fits into the company’s overall mission because immigrants often struggle to access services and resources that impact their health, and the healthcare system itself can be difficult to navigate. “And it’s a great way to see the impact your knowledge can have on a day-to-day basis,” Collins adds. Nixon Peabody’s cross-disciplinary team brings our collective firm-wide knowledge to create success with clients who are shaping the future of healthcare. We use our working industry knowledge and insight to help clients manage and implement the changes to their businesses that help them thrive in this rapidly evolving industry.